Amitabh Bachchan will be joining hands with Sairat filmmaker Nagraj Manjule for the latter’s Hindi debut Jhund. While there were initially rumours of the megastar opting out of this football film, he later confirmed that he is indeed in the film and even started shooting for it. Now it seems that Big B has been shooting for the sports film in a village. Some of them may be aware that Amitabh Bachchan plays the role of football coach Vijay Barse in this biopic of sorts, Jhund. The filming of it seems to have kicked off in what looks like a rural setting. Amitabh, who is quite active on social media, shared a series of images from the sets of this Nagraj Manjule film. Going by it, the actor seem to having a gala time enjoying the small moments of a village life. It started off with Amitabh Bachchan lying on a ‘khatiya’, which is generally used in villages to sleep or rest. The actor was seen peacefully taking a short nap whilst shooting for the film. He was seen sporting a simple shirt-pant and sweater in the recent look. Followed by that, he posted a collage of the same along with a picture riding on a bullock cart. 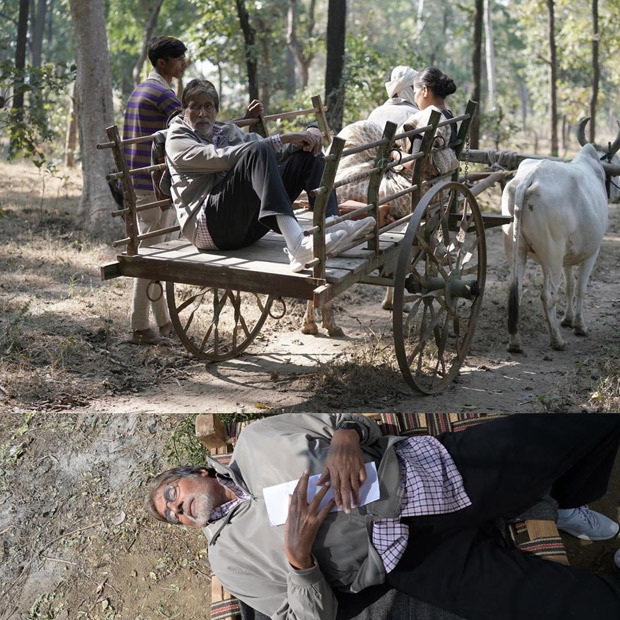 Posting the same, he captioned it saying, “Bade dino ke baad, gaon ki khatiya aur bailgaadi ki sawaari ka saubhagya prapt hua.” [After a long time, I got the opportunity to enjoy a nap on the village cot and a bullock cart ride]. बड़े दिनों के बाद गाँव की खटिया और बैलगाड़ी की सवारी का सौभाग्य प्राप्त हुआ ???????????? खटिया पर लेटने से पहले , और बैलगाड़ी पे जाने से पहले , bus में भ्रमण किया … तो हमारे हितैषी ने कविता लिख डाली : “बस के बाद बैलगाड़ी पर, खा खा कर हिचकोले। धूप में जाकर डाली खटिया, कुछ आराम तो हो ले।।” ???????????????????????????????? विशन लाल, ई एफ। Sent from my Samsung Galaxy smartphone. On the work front, Amitabh Bachchan was last seen in the Yash Raj period drama Thugs Of Hindostan, which failed to make a mark at the box office. As of now, the actor is busy with other projects and besides Jhund, he will also feature in films like Badla where he will star alongside Taapsee Pannu.